Today we hear from author and food justice activist Leah Penniman about the experiences of Black and Brown people in agriculture, and how these communities can reclaim their right to—and connection with—the land their ancestors worked so skillfully. From the divide between white farmers and their Black and Brown neighbors to the innovations these marginalized groups have brought to farming throughout history, Leah digs into a subject that is long overdue for discussion within the Good Food Movement. Food justice activist, Leah Penniman in a field. What cover cropping and vermicomposting have in common. How Europeans essentially kidnapped skilled Black agriculturalists. How Leah’s upbringing and experiences brought her to a connection with the earth and farming. Why changing diets in marginalized communities really is an access issue NOT an education, motivation, or anything-else issue. The incredible programs Soul Fire Farm is running, how they came about, and where they’d like to go from here. Leah is a Black Kreyol farmer who has been tending the soil for twenty years and organizing for an anti-racist food system for fifteen years. She’s an educator, food justice activist, executive director of Soul Fire Farm and author of Farming While Black: Soul Fire Farm’s Practical Guide to Liberation on the Land. 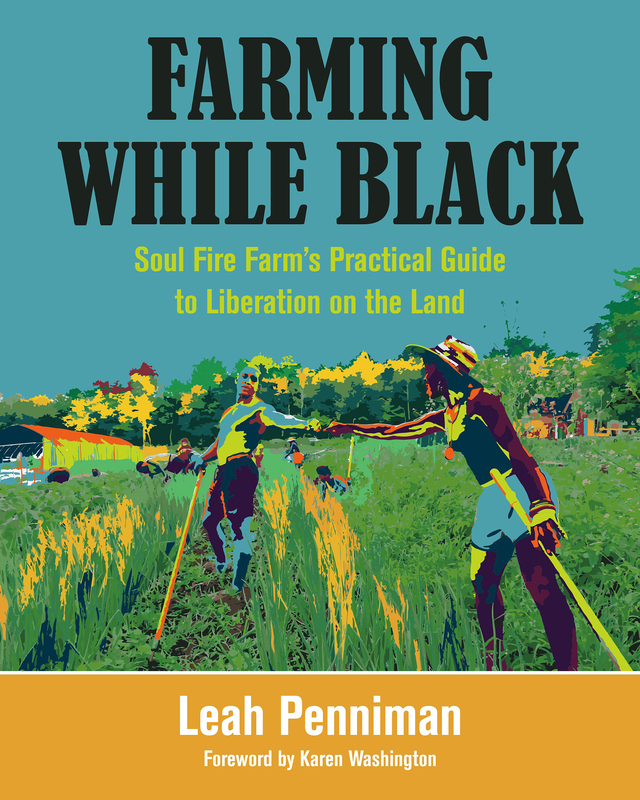 Book Cover of Farming While Black: Soul Fire Farm’s Practical Guide to Liberation on the Land. THERESA MARQUEZ: Hello, and welcome to Rootstock Radio. I’m Theresa Marquez, and I’m here today with Leah Penniman, a black creole educator, a farmer, an author, a food justice activist who has been tending the soil for 20 years. 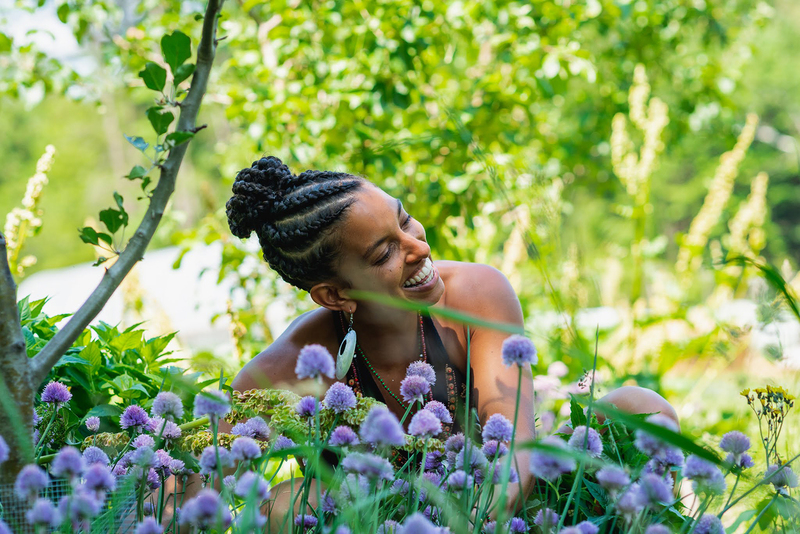 Leah is the founding co-executive director of Soul Fire Farm in Grafton, New York, a people of color–led project that works to dismantle in the food system, as well as an author of a beautiful new book, Farming While Black: Soul Fire Farm’s Practical Guide to Liberation on the Land. Leah, I want to say how honored I am to speak with you today about these issues and the Farm. LEAH PENNIMAN: Well, thank you for inviting me to this conversation. The pleasure is mine. TM: Yeah, it’s just so unusual what you’re doing. It seems quite unique, but also quite needed. And I think that perhaps many of our listeners really don’t know the history of the black farmer. You talk a lot about why this book that is focused on what the black farmer has brought to the table in farming that we don’t even know about. And I wonder if you’d talk a little bit about that. LP: Absolutely, I would be happy to. And one of the things about our work and about this book is really bringing to life that it’s not unique or different, what we’re doing at Soul Fire Farm as a black and brown-led farm. It’s actually really common, but sadly ignored by the white farming community. So there are more examples than we can go through in this short conversation. But things that maybe are taken for granted as ahistorical European like the CSA, Community-Supported Agriculture; or cover cropping with legumes, or using worms to create compost—vermicomposting. These come out of Tuskegee Institute in the South—black university; it’s the work of George Washington Carver, the work of Booker T. Whatley. And vermicomposting goes all the way back to Cleopatra’s dynasty in Egypt. And so, what I did with Farming While Black, and really the reason it was so important to put it together, is because as a black farmer myself, I was feeling isolated and disillusioned in the earlier part of my career, wondering if I was being a traitor to my people and if I belonged in this movement. And the thing that was so healing for me was to learn that what I was doing was actually part of a very long legacy of black agrarianism; it wasn’t something new and it wasn’t something French. It’s been fundamental to who we are as black people, that we innovate on land. TM: When we look at what farming was in the South, it was all done by black farmers. And yet, at the same time, now we see not very many black farmers at all. What happened? LP: Yeah, absolutely. As hopefully we all know, agriculture in the United States post-colonization was built by African Americans. We know that Europeans for the most part lived in temperate climates where they didn’t know to do tropical, subtropical human agriculture, and so, essentially, kidnapped expert agriculturists from the shores of West Africa to establish the rice plantations and the cotton and tobacco and so forth. So what happened, though, is a number of things. First of all, 40 acres and a mule was a broken promise. So after the Emancipation Proclamation, black farmers never got land. Instead they were forced to sharecropping and even convict leasing on the land. These were sort of neo-slavery conditions. And something that’s so astounding is, even in the face of this incredible systemic racism, black farmers did manage to purchase from their own earnings almost 16 million acres of land by 1910. But this land base was gradually eroded because the white supremacist culture in the South did not want to see black farmers as independent land owners. So the lynching, the cross burnings, the house burnings, really drove black people off their land. And this, compounded with federal discrimination by the USDA, made it almost impossible to make a living as a farmer. And that was part of the exodus to the North which we call the Great Migration. TM: Gee, I never even heard that term, the Great Migration. LP: It’s actually the largest migration in the history of the United States; six million black people left the South to move to the urban North. Partly to seek jobs during World War I and World War II in the factories, but what’s often not talked about is the fact that it was really a refugee crisis because 4,500 black people were being lynched during that period. So people were fleeing for their lives from the South. And it is the largest migration in the history of the United States. TM: Wow. And, you know, it just is chilling to think that this was just not even that long ago. Imagine 12.5 million slaves from Africa being brought over here. That’s a large number. LP: Right, it is a large number. And the 12.5 million don’t count the people who lost their lives in the Middle Passage. It’s just the people who made it to Brazil and Cuba and Haiti and the United States and so forth. TM: And certainly there were a lot of people that were experts and different things, but a lot of them were experts in agriculture, I think, or some part of it. And so, here we brought all these people over who really knew how to tend the land, and yet, at the same time, we aren’t very good at acknowledging that gift and that wisdom that we got. So you started doing this when you were like 16, didn’t you, Leah? LP: I did. I sort of found farming by accident. I had a very close personal relationship with the natural world because I grew up mostly rural in Ashburnham, Massachusetts, with my siblings. And we were often times the only brown family in the whole town, and so friendship was challenging, to say the least, and the earth was my solace. So when it came time to get a summer job, I was looking for something where I could work with the environment. And I was lucky enough to land a position at the Food Project in Boston, Massachusetts, and that was my first exposure to farming. And I was completely hooked, because not only do you get to steward the land, but it’s an opportunity to be of service to the community through a social justice frame. And I never stopped. I got jobs at the Farm School, and Many Hands Organic Farm, and other farms after that. TM: And so, how did Soul Fire Farm come together? LP: You know, like so many returning generation farmers, I had the dream of having my own farm. But what really coalesced was when my partner, Jonah, and I were living in the south end of Albany, New York, with our two very young children. We had a two-year-old and a newborn at the time. And that neighborhood—USDA would call it a food desert, which means a census tract where there just aren’t grocery stores and where people are mostly low income. Karen Washington, my mentor, prefers the term food apartheid because that refers to a human-created system of segregation, not a natural phenomenon. But, anyway, we couldn’t get vegetables. There were no community gardens, we didn’t have a car, there was no farmers’ market, no supermarket. We ended up joining a CSA, which is a subscription program, that cost more than our rent, and walking over two miles one way to pick up the vegetables. Which was ridiculous. And so our neighbors, when they found out that we knew how to farm, were like, “When are you all going to start the farm for the people?” And we took that really seriously. We started looking for land and got this sort of marginal eroded hillside plot 40 minutes outside of the city. And, wide-eyed and a little naïve, we were like, “We’re going to do this!” And so that started in 2006. TM: Well, you know, sometimes a lot of things happen because the people who start them just aren’t smart enough to know better. LP: Right, exactly! If we had known what we know now we might’ve never done it, so it’s a good thing. TM: Oh boy, that’s a real farmer’s story, too, I would say. And your book, called Farming While Black: Soul Fire Farm’s Practical Guide to Liberation on the Land, is a pretty, I don’t know, fiery title, but this idea of liberation on the land—I’d just like to hear you say, what does that mean to you? And how is it you came to that, the Practical Guide to Liberation on the Land? LP: Well, both were so important to me. The practical is very important, because sometimes in our social justice movements we can get very theoretical. And I give a lot of respect to folks who are good at theory. But for me, I’m a chicken-poop-on-my-boot kind of girl. Like I want to know how to do the real thing. So that was important, as well as the liberation healing piece. As my good friend, fellow black farmer Chris Bolden-Newsome, says, “The land was the scene of the crime.” And so we, as black people, have inherited a whole lot of trauma from that legacy of slavery and sharecropping and so on. But I would add that the land was never the criminal. So when we get confused and name the land the criminal and sort of blame her for the pain we’ve experienced, I think we lose a lot. We lose the wisdom of our ancestors who are beneath the ground, we lose the wisdom of the ecosystems that are trying to whisper to us how to be in community, and we lose the ability to feed ourselves and to feed our loved ones. And so liberation, for me, is really about how do we meet the earth again on sovereign and dignified terms rather than defining our relationship to the earth through this colonial lens? So, like, at Soul Fire, when we’re doing our programs, we definitely have all this practical stuff. We have, you know, how do you interpret cation exchange capacity, and how do you save seed, the wet versus dry method and so on. But we also spend some time using our healing practices. We have drumming and dancing and ceremony and storytelling as ways of reconciling with this painful past and starting a new chapter. TM: You know, it just so moves me to hear that. The other thing that you bring out, that I was saying, wow, yes, I’ve got to think about this for minute, is that there’s a disproportionate of African Americans who have health problems. And you’re an activist: How are you trying to bring this better diet, better food, this healing through your work as a food justice activist and especially your work on the Soul Fire Farm? LP: Oh, thank you for asking that. There’s a couple things I realize. One is, at first I bought the myth that we as black people weren’t eating well because we didn’t know how to cook or we didn’t know how to make healthy choices. Something that’s been so powerful about doing the work on the ground—because we do run a farm and we deliver fresh food to people’s door steps and we have youth programs and cooking programs—is that when folks have access to the good food, we want to eat it. And so it’s really an access issue as opposed to sort of a convincing people that this is the right way to go. So that’s been a really good lesson for me. And another lesson is that so often the foods that we call “healthy” in modern or Western society aren’t always aligned with what’s culturally relevant. Like not everyone wants to eat kale salad and sunflower butter. And the work of the Oldways organization has been so instrumental for me because in reframing that, because what they’ve done is they’ve created these heritage food pyramids. So like throw out the USDA food pyramid. The African heritage food pyramid has greens on the bottom, because that’s fundamental, and then tubers, and so on and so forth, and lots of spices. And we’ve tried to adapt the meals that we create and the nutrition advice that we give to really represent people’s culture. And Bryant Terry is so good this, as many other chefs who are working to remake our traditional cuisines using local, fresh ingredients. And that’s been a way to both honor culture and honor the need to improve diets in our community. TM: Well, you know, I’m really inspired by the fact that the farm, it’s not just a place that you’re going to grow great food and also honor the wisdom of your heritage. But it also is a place where you are committed to ending racism and injustice in the food system, doing a farm share program, subscription service, bringing healthy foods to other people, and you having training programs. You’re doing so much more than just growing food. And I wonder if you’d talk a little bit about how did that emerge that that’s what you wanted to do more? And how do you balance all of that? LP: (Laughing) Balance eludes me, for sure! But I will say, something I’m so excited about in terms of Soul Fire’s programs is, just like the farm itself came out of the community asking for it, quite literally all of our programs come from community asks—like, the community specifically saying, “Will you do this?” And that is different than a lot of organizations in terms of our accountability, who we’re accountable to. So we run a youth food justice program that’s one day to a week, for urban youth. We train farmers from black indigenous and Latinx communities. Most of those programs are week-long but some are season-long. And we do a lot of regional and national organizing around land reparations—giving the land back to the people from whom it was stolen, and the resources. So that looks like policy and land trust work. But literally all of these things came from someone coming up to us, or many people, and saying, “Hey, you know, that’s really nice that you’ve trained us and now we have all these skills, but we don’t have any land. So how can Soul Fire help us get land?” And a couple years later, here we are, incubating a new regional land trust for farmers of color that’s soliciting land donations and giving out long-term leases. So some of that is maddening for my five-year-planning, left-brain, A-type personality, but it’s a really, really good lesson. And it’s not that we do whatever. Our mission is to end racism and injustice in the food system and to always have that based on the farm. But how we do that is very responsive to the community. TM: That’s so exciting to think about that. And you’re reminding me, you know—of course, I work for a co-op and we have seven co-op principles. P6 is co-ops help other co-ops. P7 is co-ops work and support their community. And I see that you’re doing that. But I’m just wondering, how are you structured in your ownership here? Is it a collective ownership? LP: Oh, that’s a great question. Yeah, it’s evolving. And so we have… The Soul Fire Farm Institute is a nonprofit organization. We started out as a family farm; we were just a sole proprietorship doing a lot of this stuff, all volunteer until 2016. In 2016 we incorporated—we got 501(c)(3) status. But we still operate the farm as a business in the sense that we want the farm to pay for itself. Since it is a model and teaching farm, we need to make sure that we show people viable ways of running a business that aren’t grant-dependent. And then the educational programs come through fundraising as well as speaker fees and things like that. So we have a board of directors. The type of board that we elect, though, is a community-based board. So it’s not rich folks who just do fundraising or have technical experience. We have farmers, CSA members, programs participants on the board to keep us accountable. And then the staff—there’s just a handful of us—we have distributed leadership. So each team kind of makes decisions about its area, and we have three co-directors. All that said, the land itself is in a collective. And so there’s a little, I would say, a young intentional community that we’re forming that is run using the “one member, one vote” co-op structure. And we’re in a legal process right now of finalizing how that’s all going to work. TM: If you’re just joining us, you’re listening to Rootstock Radio. And I’m Theresa Marquez, and I’m here today with Leah Penniman, a black Creole educator, a farmer, an author, and a real food justice activist. And we’re talking about her farming, her book Farming While Black: Soul Fire Farm’s Practical Guide to Liberation on the Land. And, Leah, can you go back a little bit? I’m really intrigued by this idea that you are actually working to try and do some kind of an incubator land trust, I think you called it? It sounds pretty exciting. Tell me a little bit about it. LP: Yes, well, I am tantalized by this project because, I’m just so excited about it. So this came out of a bunch of alumni of our Black-Latinx farmer training program, as well as other rural farmers in the Northeast started having these potlucks, because frankly, it’s lonely up here as a black or brown farmer. Oftentimes you’re the only person in town, your neighbors might not be so psyched about what you’re doing. So we just started saying, let’s get together in the winter, build relationships, show up for each other’s volunteer days, and all that. And it quickly became apparent that we had a common need, which was land. Most people were leasing or they were wage laborers, or if they had land, they wanted to not own it privately, to own it collectively, right? And that is compounded by the fact that in our area, the indigenous folks who are native to this place have almost no land left. So we started a collaboration between the farmers and the indigenous communities to say: How are we going to get some land, not to own privately but to collectively steward and to use for sustainable farming and for ecosystem restoration and ceremony? So we—it’s a new process. We’ve been learning for a couple of years now. And we just hired co-coordinators for this organization. We just elected a council, which is our leadership structure. And we’re going to be incorporating and moving forward. But even though we haven’t created the organization, we already have people lining up to donate land to put land into this land trust, because they believe in the vision. And we have folks around the country looking to us to say, “Let us know what you’re doing, we want to replicate it in every region.” So we’re very, very excited about this project, because we think we can start to make a difference in terms of how land is held and who gets access to land. TM: That is inspirational and so exciting to hear. I think ten years from now we’re going to see a different kind of landscape out there in upstate New York. And in fact, my next question was going to ask you whether you were partnering with the Native Americans, who certainly are a great example of it’s their land, and not anymore, and how wrong that was and is. LP: Oh my goodness, how wrong it was and is. Like I just learned that as recently as 2005 the Oneida nation had sued to get some of their land back. And the Supreme Court came down and said, “I’m sorry, the Doctrine of Discovery still applies,” which is this idea that came out of the 1400s that only white Christians had the right to land, and anyone who wasn’t a white Christian, well…sorry, finders keepers. So this is 2005! And so it would be so disingenuous and immoral to do any type of land organizing without trying to center the needs of indigenous communities. And we’ve been very, very blessed that some of the folks from the Nipmuc community and Mohican and Schaghticoke and others have come to the table with us to talk about how we can work together. TM: So inspiring to hear that. Before I ask you this, you are a 501(c)(3). Do you have a website? Do you have a way that people can look and say, “Gee, I want to invest in this”? LP: Yeah, we would love people to get involved. You can find out about all of our programs at www.SoulFireFarm.org. TM: It would be super to hear from you about trying to learn about how to uproot racism. And also, you make a real good point of how this book, while about the Soul Fire Farm, is really for all farmers. This idea of coming to a farm like yours seems like a really great idea for a lot of people who just simply are kind of not really understanding all the issues. So how does that work? LP: Well, it’s such a great question. And I did write Farming While Black thinking about everyone. Certainly the central audience is what we’re calling the returning generation of black farmers, folks whose grandparents and great-grandparents fled the land for different opportunities, and we’re seeing that there’s value there in wanting to come home. But of course, black people or people of color didn’t create a racist food system, didn’t create a situation where almost all the land is owned by white folks, or where, if you’re black or brown, you’re much more likely to die of diabetes, heart disease, obesity, and all these diet-related illnesses, or where farmworkers aren’t treated right. So it’s actually all of our responsibility to heal and repair the food system. And so, that chapter 16 gets really explicit about it. It talks about how do we transfer resources? What laws can we change? What are the ways that all of us can take leadership in creating a healthy food system and be accountable to communities of color in that process—really listen and not assume that, as outsiders, we know what’s needed? And that’s very important for us. It’s very important for us that we’re all working together toward a common goal—hopefully a common goal, right?—of having a sustainable and just food system. TM: It is so important. And I certainly know that there’s a lot of youth of all colors who are struggling to try and figure out how to get land right now. TM: So I wondered, what do you think the opportunity is, given our current policy or current administration of divisiveness, of all the wealth going to rich, of the erosion of the middle class, and so on? Do you think that this is a time that we are opening up opportunities for more alliances, more working together, more trying to accelerate change? LP: I mean, that’s certainly my hope. The ruling class has used divide-and-distract tactics since the beginning. I mean, you look at Bacon’s Rebellion when black and white planters were trying to rise up against the ruling class, and the response to that was to disproportionately punish the black folks in the uprising, imprison them, and pardon the white folks, and then to codify race in the Virginia codes as a way of really preventing that dangerous alliance between working-class people. And we see that throughout history, with the dismantling of the Southern Tenant Farmers Union and so on. And even today, if you look at upstate New York, traditionally it’s been dairy country for some time. And with the removal of price supports and the “get big or get out” policies, the rural economy has completely eroded and been replaced with a prison economy. And so, if we look closely at what actually is happening there, now, because most of the jobs in some of these small towns are prison guards or prison contractors, there’s an incentive to have the prisons filled with people, who mostly come from New York City from seven zip codes and are mostly black men. And so all of these rural politicians are advocating for these “get tough on drugs” laws, and so on. And it creates this sense between rural white folks and urban black folks that we have nothing in common; our interests are actually misaligned. But that’s by design. It’s by design to keep us separate, when in fact we would all benefit if we had reform in the criminal injustice system and we had a restoration of rural agriculture as a healthier economic base than prisons. And so I think we need to just see through the smokescreen and see that we all have these common interests as working people, and figure out how to get past the empire’s technologies of separating us. TM: Well, you know, I’m so grateful and also glad that you started talking about this erosion of the family farmer all across the United States, but definitely where you are, and then the increase of the prisons. And I wonder, in California, they have a lot of programs for inmates working on farms. Have you ever thought about something like that with Soul Fire? LP: Yeah, it can be a tricky thing, because something we definitely are against, we are against slavery in the prison system. So we know that the 13th Amendment outlaws slavery except in the case when you are convicted of a crime. And that loophole has been exploited throughout history and continues to be exploited. There’s a reason why it’s people in orange who are putting out the fires in California. And so, sometimes penal farms can be a neo-slavery where people are working for free, or like one dollar an hour or so on, to grow this food. So we’re not about that. We are definitely about reentry programs and giving people jobs that they chose of their own free will. We’re personally not doing that at Soul Fire, mostly because of our geography, but we do have a lot of farms in our network who are doing that reentry work, and we do our best to support them. TM: Yeah. The programs that I’ve heard, haven’t really been so much that they really needed this, but that it was this this opportunity for inmates to create. So anyway, I’m just really delighted to be talking with you about it. What do you think, what’s the next moves for you personally and as far as the trust and the farm? What is your hope for the next decade? LP: Wow… Well, I hope we win. My hope for the next decade is that we’re able to redistribute land fairly, that we’re able to make sure that everybody has access to healthy, culturally appropriate foods, and that we have strong legal protections and dignified work for the people who grow our food, particularly the folks that we label as farm workers who are often guests in our country, and fair immigration policy and pathways to citizenship for those who want it. So that’s really my hope. And we’re just going to keep listening. We, at Soul Fire, our job as we move toward that vision is to keep listening to community and be agile and nimble and responsive so that we are of service to the maximum extent possible. TM: And for those of you out there, www.SoulFireFarm.org. Did I get that right, Leah? TM: And please check them out, and if you want to get involved I think there’s probably lots of ways to get involved here. And it’s really been an honor to talk with you, Leah. Thank you so much for all the good work you’re doing. It’s an inspiration. LP: Oh, thank you too. This has been a really fun conversation. I appreciate it.